Grab your fork and prepare to eat your heart out… vegan style. For the uninitiated, that means ditching the animal products: no beef, no chicken, no fish, no eggs, no milk, no mayo, no baked Brie, and (saddest of all), no ice cream. Sounds like a diet for masochists and weirdoes, right? Wrong. The vegan diet is more than lettuce wraps and tofu. 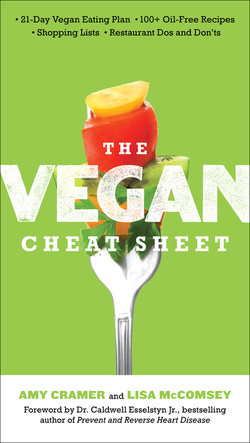 As our new book, The Vegan Cheat Sheet—reveals, veganism is not even a diet—it’s a way of life that is super easy, fun, and gratifying. Go ahead: Eat your lasagna, your blueberry pancakes, and your Caesar salad. Indulge in family pizza night at Domino’s (we’ll share our restaurant-ordering secrets for this and other popular chains). Create mouthwatering meals in 20 minutes or less with our simple, three-step recipes. And, by the way, get all the vitamins, minerals, and nutrients you need (all that talk about protein-deficient vegans is a bunch of baloney). Best of all, you can go vegan in just 21 days—because we make the vegan transformation a snap. While we—both former omnivores—had to muddle through dozens of books, websites, and magazines to learn the ropes, we’ve done all the legwork for you. Here are your menus, your shopping lists, and your travel tips, all packed into one go-everywhere, user-friendly guide that fits in a purse, a pocket, or a glove compartment for quick reference in the restaurant, grocery store, or fast-food drive-through. down—or just feel amazing—you’ll love this colorful lifestyle. Have questions, concerns, or testimonials about going vegan? We’d love to hear from you! Photo by Susan Woog Wagner. Wardrobe: Swiss "chardigans" courtesy of Whole Foods.